George William Horlor was born in Bath around 1819. He married Mary Cook on 15 March 1845 and by 1851 was living in Cheltenham where he had established himself as an artist. 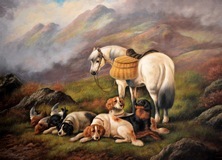 It was around this time that he began producing sporting paintings often set in a Highland landscape. Horlor developed a distinctive painting style, characterized by a quick application of paint, to create soft, atmospheric effects. 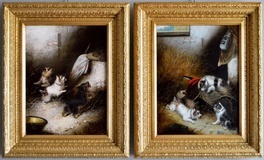 He exhibited at a number of the major galleries including the British Institution and the Suffolk Galleries from 1849-1891 as well as at the Royal Academy from 1854 where he exhibited 19 paintings over the years. 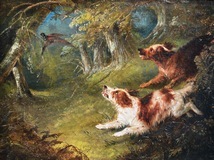 One of his paintings ‘A Day’s Sport’ was praised in the Art Journal review of the Royal Academy exhibition of 1855. He died in South Stoneham, Southampton in 1899. 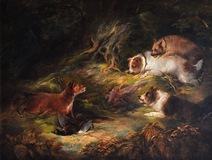 Examples of his work are held by various public collections including the Wilson Gallery, Wednesbury Museum & Art Gallery, Stockport Heritage Services and the Royal Collection at Osborne House.